Yes . . . that’s me. 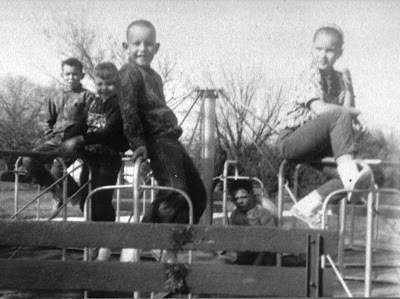 Front and center on the merry-go-round, a fitting metaphor for much of my life, round and round he goes; where he’ll end up, nobody knows. For too long, it depended on who was pushing and how hard. Just keep smiling and whirling . . . until you fall off. In the early days, someone picks you up and stretches a band-aid across your knee and offers you a Popsicle and tells you to hang-on better and go a little slower. In later days, they point and whisper and you are but a silly fool who should have known better than to go on the ride in the first place. The pain of the fall does not diminish with the passage of time, but as the dirt becomes more familiar you lay there longer until you realize that at some point you are expected to get up on your own. I’m not a potter and I don’t have a way with clay, but if I was and if I did, I would certainly have gone a little lighter on the ears . . . and maybe shaved a bit off the high level of uncertainty and doubt, added a bit of reinforcement to the walls for resistance to sin, and certainly upped the awareness to yield and the desire to seek. A little reshaping within and without: a better vessel. Instead, the ears are there, the doubt is clearly visible in the color of the clay and the edges have become brittle and vulnerable to the effects of sin, the pouring spout itself a bit eroded from the corrosion of bitterness. It’s me. Slowly-changing, yet ever-resembling the me I have always been. The old me cast aside to become new, but always tip-tapping at the window panes, begging to come back inside, the old eyes peering into the new, questioning and accusing and sowing confusion. The where I’ve been challenging the where I’m headed. The I’m free of me mocking the me who’s free. Who would have thought that a little “me” could be so enveloping, so demanding, so revealing, so undoing, so pursuing, so unforgiving, so deceiving, so unworthy, so treacherous and sly, so bound? Who would have thought that a little “me” could be so beautiful, so valuable, so intricate, so unique, so sought, so true, so worthy, so accepting and open, so free? Sometimes I think the principalities of darkness have nothing on the internal struggle between me and me. And then I realize it is not me, but the proximity of those principalities and the propensity I have had to welcome or to at least justify their presence, proclaiming myself too weak to push back against them. After all, I am just . . . me. I think when we are unhappy with “me,” two things happen. We try harder to be like others and we try harder to hide the me we don’t really want to be. In doing so, we sometimes pick up characteristics and traits that were never ours in the first place and we hide others that we might have just been misusing or neglecting somehow, which become rusty and misplaced, but were a big part of the “we,” that’s you and me. We self-diagnose and we react with reinvention to the diagnoses offered by others and hop on the “Maybe-this-will-work” merry-go-round and spin the days away until we hit the dirt in an out-of-balance daze that reveals to everyone we are just “me” trying to be what others wish we were. You can travel a long ways down the right road in this life and them stumble on an errant stone and be declared a treacherous transient by the righteous who move to the other side and continue on their way, leaving an unfolded map at your feet, just in case you wake up and want to join them on a perfect journey. It seems like we think preservation comes through complication. The more difficult we can make this path to change, the more we will prove we deserve to have arrived. The more of “me” we can leave behind, the more different we can become, the more we deserve for others to embrace “the new me.” The more others can spell it out in as big a word as possible, the more they can measure your success against their own. It doesn’t really work that way. The me I am today is so different than the me I was just a few short years back, but yet I am the me I have always been. Confounding as they may be to others, that’s how God works. He creates a “me,” loves a “me,” frees a “me,” forgives a “me,” hears a “me,” wants a “me.” He changes me, but he still knows me as the me He created me to be. Unfortunately, that’t not how we work, so caught up are we in “change me,” that we cringe at the idea that we are, despite our dings, still created in His image, still worthy of His love, still forgiven, still able to be softened and shaped and molded to conform to His likeness instead of to the world’s, which, in truth doesn’t so much care about you or me . . . but only about what they can do about us to make us more what they want us to be, depending on the perspective of the “me” they themselves happen to be. And since we want them to be happy with who we are, we bend and twist and project our recovery and rejoice in our victory and smother our misery at the encumbrances of change. If we can provide enough positive evidence, they’ll be pleased. You’ve probably already tried to please men, becoming what you thought would make you more wanted so you could have more of what you thought you wanted. How has that worked out for you? It didn’t do a lot for me. On the rebound-merry-go-round, such a pattern produces a warped repentance, a check-list once again designed to please men, a facade rather than a changed heart. Just wait and see . . . I’m a brand new me. And then, if the repentance is not real, under the pressure of time and temptation, the facade crumbles and the burdens win and we retreat into the same old me-ness. The me is not the problem. It’s the “my.” It’s the things we bring in and make ours. It’s what we do and allow to be done to the “me.” From the moment we as little ones point and shout and cry out “me want!” to the moment we begin to point inwardly and cry silently “want me?” we are confusing ‘my” and “me.” My body — ears and all — is not me. My possessions are not me. My cravings are not me. My sins are not me. I am me. Heart and soul. Created in the image. All that is within me is me . . . and He is in me. All those other things that swirl around me and label me? They may be what people see, but they’re not me. But, as long as I believe they are, they will define me. As long as I let others say that what they think of me is me, then my reactions will determine where I go and what I do and how I live and who I serve and who I please and who I seek and who I need and what I want. We lay out a plan out to help us find freedom, yet we know He set us free. We strive mightily to find peace though he clearly says He will just give it to us. We look for love though He says He has always loved us. We bargain for acceptance though He says He will never leave us. We pine for our place in life though He has already prepared a place for us beyond it. We walk stooped over in shame and stumbling under guilt, though he says He forgives us. If we believe what He says, we can certainly reduce the stress of striving, looking, bargaining, pining, stopping, stumbling. It would definitely leave true energy for real repentance. Which begs the question. What in the world is wrong with me? Just that. The world. It’s nothing that Christ can’t handle when the me of you becomes we in Him. Me . . . or Christ in me? That is the question. As always, stirring and powerful. Yes, Thom, well done again. While your blog posts don’t get a lot of comments I hope you know they are appreciated. Thanks, Matt. I just assume since most of the readers are Southern Baptist, silence is agreement . . . or I would definitely hear about it. Thanks for reading.